This recipe was a fine hybrid of my cooking. Within this dish I was able to combine the usage of a crockpot with carb replacement. Over the past year I have been using several different vegetables in lieu of pasta. I have tried and enjoyed zucchini in place of spaghetti and cauliflower for rice. Both of those have gone well. 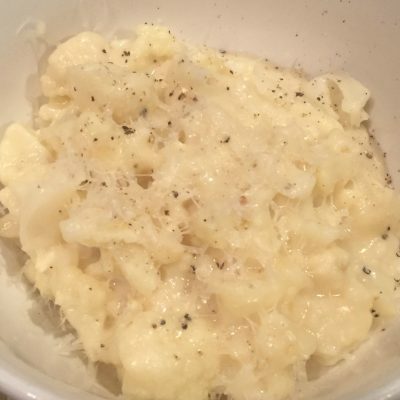 For today’s recipe I wanted to try cauliflower in place of pasta in homemade mac and cheese. I knew that it wouldn’t have the same shape, but I did hope that it would have a similar feel. Pasta becomes fairly tender, as does cauliflower, so it didn’t seem like a ridiculous attempt. I also wanted to cook the majority of the dish in the crockpot, as I wanted it to be as close to one-step cooking as possible. My regular mac and cheese bakes for about half an hour in the oven. I knew that the cauliflower would be raw after that small amount of baking time. I didn’t want to parboil the cauliflower, so as to save time and flavor. Cooking in the crockpot would allow this dish to simmer, soften the cauliflower, and infuse more flavor. I really enjoyed this dish. While I wouldn’t call it a healthy dinner, as there is a good amount of cheese and some butter in it, it also isn’t horribly indulgent, as I use skim milk instead of whole milk or half-and-half. Note: This isn’t a put it in your crockpot and go to work dish. It’ll need only a couple hours of cooking. It’s perfect for a lazy Sunday when you can start dinner in the late afternoon. Melt butter in small pot over medium heat. Add flour, whisk until slightly golden, about 3 minutes. Continue to whisk until thickened. Add cheese, stirring until blended. Cut cauliflower into 1-inch dice. Put cauliflower in large (5 quart) crockpot; top with cheese sauce. Stir; cover and cook on high for 2 hours. Serve with a sprinkle of salt and pepper, if desired.